In today’s A Lab Aloft blog entry International Space Station Chief Scientist Julie Robinson, Ph.D., shares the benefit to using the space station as a platform for Earth remote sensing instruments. One of the amazing things that you’re going to see on the International Space Station in the coming years is its emergence as a serious remote sensing platform. Looking at the Earth from space gives researchers a powerful vantage point to study our planet’s water, air, vegetation, and more. People in remote sensing are used to having their own satellites and putting those instruments at the perfect orbit so that they go over the ground at the perfect time. Fortunately, when the space station was designed, planners recognized that having a platform in low Earth orbit (LEO), which is about half the altitude of most Earth remote sensing satellites, provided researchers the opportunity to do something unique. Designers put locations on the station exterior that provide data, thermal and power support. Basically the space station is a giant, well-equipped satellite that can host a wide variety of remote sensing instruments—dozens of them. Now that the space station is complete, we are starting to see scientists take advantage of this platform as their sensors get launched and mounted. I want to talk a little bit about why these instruments are finding a valuable home on the space station. 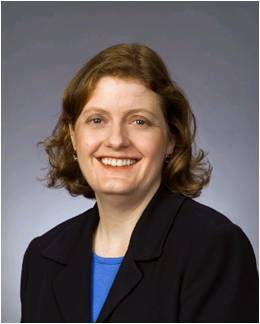 I also want to mention that there are openings through the Earth venture instrument opportunity and other calls via NASA’s Mission Directorate for both small, lower cost instruments and venture-class instruments. It’s wonderful to see the entire Earth science community looking at how the space station can help them achieve their research goals. One huge advantage to using the space station is the frequent transportation to orbit. The abundant power and data capabilities are also tremendous benefits. Something else to consider is that station is a bit more jittery compared to other Earth remote sensing satellites, but engineers can adapt designs to work around this, as well as to manage contamination concerns for such a complex vehicle. When I look at the instruments coming to the space station, one thing that is singular is the 51.6 degree inclination of our platform. 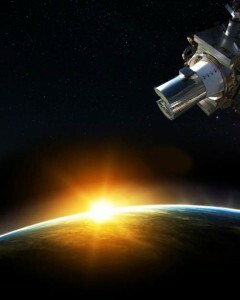 That means that instead of passing over at the same time every day, which is typical of an Earth remote sensing satellite, the space station actually has a precessing orbit and does not go over the poles. In other words, the ground track moves westward along each of 16 daily tracks as it travels, with ground track repeats every three days, and a 63-daylight cycle. That gives you some unique opportunities. While at first it may not appear ideal for certain kinds of Earth remote sensing, researchers are working with that difference to turn it from a challenge into an asset. What I’m seeing in the instruments coming forward are some trends in how they are using the space station to their advantage. 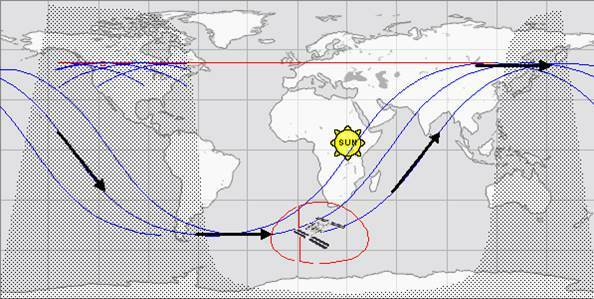 One area is in the capability to fill data gaps using station-mounted sensors, specifically where other satellites have failed or not yet made it to orbit. Station provides a rapid turnaround opportunity to fill those data gaps, providing a fuller insight into each area of research. A second trend I’ve noticed has to do with areas where there is a new airborne technology. People would like to have those get on global satellites, but first the instruments need to be tested and the technology refined. The space station is a great place to do that kind of advancement, so that in the future the more expensive satellite mission can be successful. Another group of instruments are taking advantage of the diurnal—daytime and daily activity—variability of the station. For instance, if you have a sensor on a satellite in sun-synchronous orbit, it goes over the ground at the same time every day. When you add a second, parallel instrument you can take advantage of observing things at different times. Think of MODIS, which is going over the tropics daily at the same time. That area may be cloudy most of the time, because of the specific schedule. With the space station, however, you could now and then get that same data early in the morning before the clouds have built up. Another pattern we are seeing is the opportunity for cross-calibration, where researchers compare data sets from both the station- and satellite-related sensors. It can be really valuable to have a second instrument aboard station for this cross-validation of data. There are several instruments in orbit now, and the station will eventually pass under each of those sensors and simultaneously collect data. That allows for the cross-calibration of instruments that would otherwise be impossible. With that as a background, here are a few highlights of instruments coming up for use aboard the space station for remote Earth sensing. The Stratospheric Aerosol and Gas Experiment III (SAGE-III) is a spectrometer that uses occultation. This basically means that it looks at the light transmitted from the sun or the moon filtered through the atmosphere and measures the aerosols that are found there. 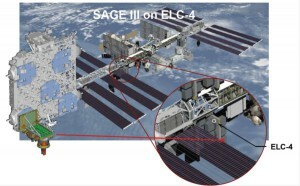 SAGE-III is scheduled to launch to the space station in 2015. This latest spectrometer has a heritage of previous SAGE instruments that discovered the ozone hole, which we all know about now and that led to the 1987 Montreal Protocol. The updated SAGE-III will help us understand atmospheric composition and long-term variability. The space station’s orbit is actually ideal for these types of occultation measurements. Having the opportunity to mount this major instrument to our platform is thrilling. Another instrument that is going up to station very soon on SpaceX-5, scheduled for 2014, is a LIDAR instrument looking at clouds. Called the Cloud Aerosol Transport System (CATS), this sensor will mount to the JEM exposed facility. This is a case of testing an instrument that was developed for airborne use, but has not flown on a satellite yet. What CATS does is it emits a laser light signal at three different wavelengths. It then looks at the signal that comes back to measure the layer height of the clouds, the layer thickness, the backscatter (the reflected light back), the optical depth and the depolarization. In so doing, CATS helps us understand the structure of those clouds. This is hugely important for global climate modeling, because clouds can function as insulators. They can prevent sun from getting to the ground, and they also can prevent heat from getting out of the Earth. The ISS-RapidScat also is planned for launch to space station in the not too distant future. This is a radar scatterometer measuring ocean wind speeds. The instrument is a refurbished engineering model of the sea wind scatterometer that was on QuickScat, which had some failures. This updated version is a data gap filler and the information is used by the National Oceanic and Atmospheric Administration (NOAA) and other agencies in predicting hurricane intensification and understanding these major storms. 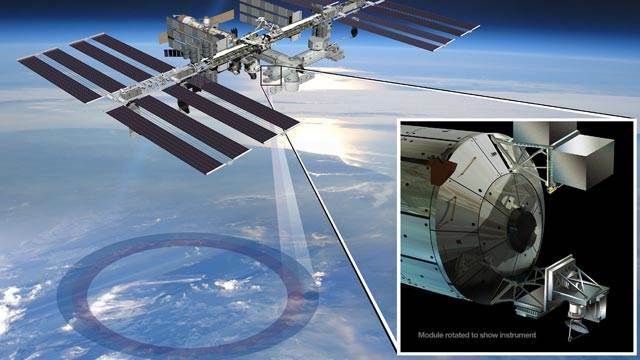 The next satellite scatterometers that will go up are going to have intersections with ISS-RapidScat. It’s inspiring to see the cross-calibration capabilities that come with this series of instruments. 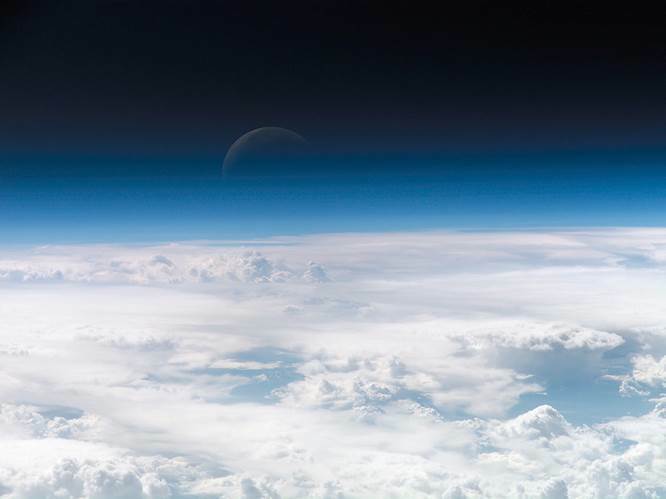 The space station provides this extraordinary emerging opportunity with rapid implementation of airborne and space-borne instruments to fill data gaps. This includes the ability to test an airborne technology globally before launching a premier satellite-based instrument, as well as the ability to take advantage of the somewhat unusual space station orbit tracks. We can capture diurnal opportunities that other instruments miss and even use the data to cross-calibrate across a constellation of sensors to really improve the quality of the overall global data sets. We are going to have our first dedicated session for space station remote Earth sensing at this year’s American Geophysical Union meeting in San Francisco, from December 9-13, 2013. It is encouraging to have all of these newer science instruments coming to space station in the next year or two. I am thrilled to see the scientific community putting their creativity out there as they think about what instruments make sense for the space station and proposing those in solicitations. of research of environmental findings. Also, this information is a really good source of education for senior citizens, like myself, who are tired of getting marketing lies on the TV and media outlets. I Thank you and hope you will continue this vital effort.